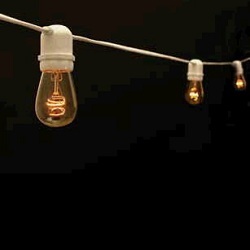 String Bulb Lighting, White - per ft. This light set is ideal for stringing across tents, courtyards, walkways and entry ways. * Please call us for any questions on our string bulb lighting white per ft. rentals in Shreveport and Bossier City, Louisiana.